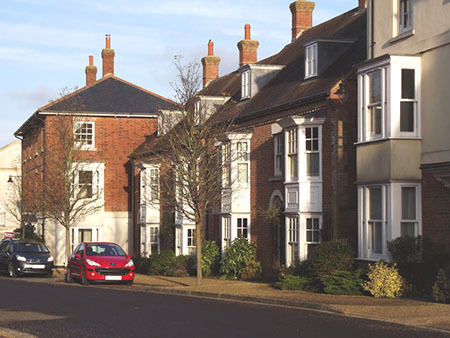 Poundbury, Dorchester, something different, yet so traditional. Is it a town? Is it a suburb? Is it an urban extension? Is it a village? 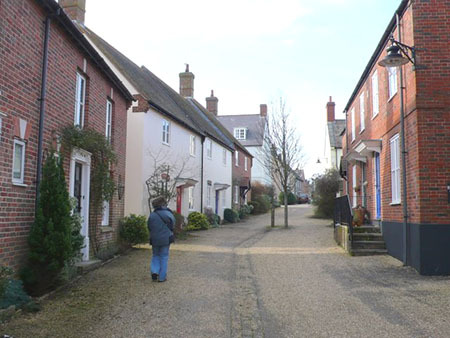 A village like street in Poundbury. It is an urban extension with a difference - experimental, controversial, back to the future. It goes against all the planning concepts of the last fifty years or more. To start with the car was not considered, people were. It was to be people centred where everything was within walking distance, schools, shops, leisure, employment. As it was before modern planners got into the act. The concept is based on the Prince of Wales book, "A Vision of Britain, A Personal View of Architecture" (see right hand column) and is built on 400 acres on what was Duchy of Cornwall land alongside Dorchester. Prince Charles worked with the West Dorset District Council on the concept and plan of the new urban extension to Dorchester. It has certainly created interest among architectural professionals and town planners. Somewhat of a tourist hotspot for those folk. To start with 150 acres of the 400 were devoted to landscaping, the lungs of the area, so vital to people. The rest of the land is multi use building, both housing and commercial with a little industrial. The buildings fit in with Dorchester and are both modern and antiquated in design as they would be in any old town - the back to the future concept. Old fashioned with a modern twist perhaps. 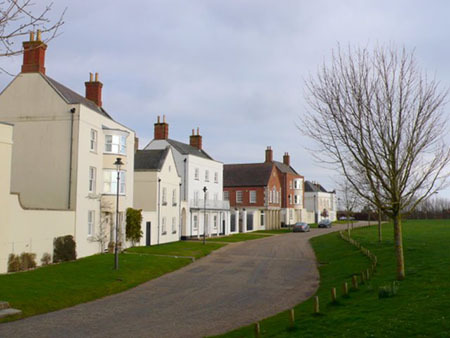 Poundbury has a vision of a population of about 4,500 with a large number of them working in that area. Housing is of all styles and sizes, all types and uses, from larger freehold to social housing and everything in between, all mixed up in the same streets. The Duchy of Cornwall's aim for the area was sustainability and this is increasing as development occurs. Good design incorporates consideration for the climate both inside and outside the buildings, in how the project is built and environmental concerns both for the environment itself and the utility costs for the occupiers. Green is king (well prince perhaps). To meet this the Duchy of Cornwall has developed an Anaerobic Digestion plant at Rainbarrow Farm, close to the development to provide biogas for this urban extension of Dorchester. A dictionary defines anaerobic in this instance as: "Anaerobic bacteria produce energy from food molecules without the presence of oxygen." The local farmers wanted to dispose of their waste, the area needed gas, such a commonsense idea as to be a no brainer really. Very efficient apparently. There are other green ideas in the housing. Some houses are of an Eco design which really does make use of new technology in power issues. Other places are also incorporating at least some green ideas. The buildings in the area must conform to a design code. Leon Krier born in Luxembourg in 1946 and now living in France was the urban planner appointed by Prince Charles to plan Poundbury. Krier is the main driver of New Urbanism and New Classical Architecture school of thinking. He is definitely not a believer in modern planning with its centre as the car, but believes towns and cities should be people liveable and environmentally friendly. He would undeniably be a kindred spirit with Prince Charles who is a great believer in green principles, Highgrove House and gardens are run on such green environmental criteria. After years of planning the extension to Dorchester started building in 1993. The design of Poundbury is set in four phases, the first phase is complete with Pummery Square as its pivotal point and Brownsword Hall as a centrepiece. 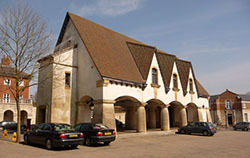 Like many an ancient town Brownsword Hall has a farmers market on a couple of Saturdays a month and the upper storey is a community hall run by The Poundbury Village Hall Trust. Round the square are shops and businesses with residences on the upper floors. Phase Two has Queen Mother Square as its centrepiece and is underway. This Square is the district centre and even has a small supermarket that apparently sells local produce which is a bonus. The Square is named of course for the beloved grandmother of Prince Charles, she died while Poundbury was being built. The southwest quadrant of Stage Two has views to Maiden Castle. This has Buttermarket as its centre, a name - rather an ancient name in cities of old that is still retained today. However it does not sell butter as those old ones would have done. It does have retail outlets, but it has workshops too. Parkway Farm is also part of Phase two and is the small industrial estate of the development giving employment to local people as does the currently 170 businesses all over the development. Phases Three and Four have planning permission and are underway. Can people use their cars, yes. There are roads they can use and parking is at the rear of the houses in attractive courtyards. Altogether rather a pleasant place to live and work. A good place for working at home too! There is plenty of time to get a nice new residence there, Poundbury is not due for completion until 2025. For more information about the plans for Poundbury visit the Duchy of Cornwall site scroll down and download their Poundbury Information leaflet, it is in PDF format. HRH The Prince of Wales site gives further information and some good pictures. Architect The magazine of American Insitute of Architects has an excellent article from an architectural point of view. Poundbury The official Poundbury site. Or you might prefet to browse some more, please do, you will find navigation buttons above on the left.